Alice Stanhope is 40 years-old when she is diagnosed with Stage 3 ovarian cancer. She is the sole carer of her 15 year-old daughter Zoe, and has never needed anyone else up until this point in her life. But her grim diagnosis gets Alice thinking that may have to change, and soon. Thankfully, her cancer-care coordinator, Kate Littleton, and her social worker Sonja, offer the help and support she needs, and extend that kindness to Zoe, who suffers with social anxiety. Kate steps in and offers to take Zoe in whilst Alice recovers from surgery. And whilst Alice initially has her hesitations, she eventually learns to accept her fate and allows Kate and Sonja to make her dark journey a little brighter. The love that Zoe and Alice share is so special, and I think that the author did a great job of capturing their relationship perfectly. Here are two people who have always depended upon one another for support, encouragement, and companionship, and they both have their lives turned upside down with this terrible diagnosis. It is very emotional, and the reader gets a real sense of their closeness. I really felt for Zoe as she had so much to deal with. A debilitating mental illness, a sick mother, and the uncertainty of her future. Both Kate and Sonja also have their own personal battles, although I felt that the story could've done without Sonja's struggle. It just added a layer that detracted from the main topic and didn't fit nicely in the storyline. Many of us take for granted the support and love we have from family and friends, and this book gets you thinking about those that don't have that option, as well as leaving the reader asking what they'd would do in a similar situation. Whilst the story is rather sad, there are elements of humour throughout, as well as hope. It is a thought-provoking novel that is told with a lot of emotion. 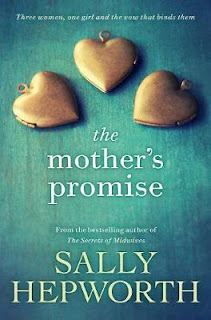 Disclosure: I was given an ARC of The Mother's Promise with thanks to Beauty & Lace and Pan Macmillan in exchange for an honest review. To read the original review on the Beauty & Lace website, head here I have not been paid for this review. All opinions are my own and not influenced in any way. Sounds very interesting but might just hit a bit close to home --- I don't have any family support here in Australia and while I have some wonderful friends, I always wonder if push comes to shove, will I be all alone? Oh gosh, sounds like it would be really moving. Might need to keep a few tissues handy before reading this one! That sounds like a novel I'd struggle to get through. I'm sure there are miles of happy moments but the sad ones might outweigh them for me. This sounds like a real tearjerker! I'm terrible with sad books and movies, but I think a lot of people would love reading emotional stories like this. Thanks for the review! Oh, wow... this sounds like heavy going. Ovarian cancer is something I find very scary, and this would be tough but rewarding reading, I think. Sound like an emotional book, only because I am a mum, and I could never imagine having to go through this. It's all too real for some though sadly.